Do I have to register on this website to attend this event? No of course not. Please do join us. Please Note that you will not be on the registration list to receive one of 200 loot bags or be entered in the draws for the door prizes. I registered to attend the trade show. Do i just show up and sign in? or will i get tickets sent to me? Just show up and sign in at the registration table. No tickets will be sent out. Are husbands, children & other family members allowed to attend? Is the parking free? Where should I park? Parking is FREE!! Please parking around the side of the hotel. You can access the trade centre through the Convention Centre glass doors. Can I bring a stroller into the trade center? What is in the goody bags that are handed out to the moms that register and attend? Business brochures, business cards, local magazines, coupons, great samples & more! How are the winners for the door prizes selected? Will the door prizes be handed out to the winners at the show? Door prize winners will be randomly selected from our list of moms that register and attend our event. Prizes will be handed out on the day of the event. Winners will also be announced on this website on Feb 22nd, 2010. Is there only 1 exhibitor table allowed per company? We are accepting only one table per direct marketing company (ie one Avon rep, one epicure rep.. ect) This way there is a variety of businesses available for the moms attending. What is the cost to book a table? Table pricing and further information will be shown when the date is announced. Check the Exhibitor Information page. Do you have internet access and power outlets? Is there some sort of back drop for the tables that are located in the center area of the trade centre? No there is not. To keep the exhibitor costs down we only provide the table (size depends on what you choose), white table cover, skirt & 2 chairs. We do not provide a back drop or a table divider. Your wares are limited to the table size you selected. I would like to have someone help me at my table. Is this allowed? Can I share my table with another business? Or provide info about another business on my table? Exhibitors cannot share tables. All information located on the table must be from the business name submitted on the registration form. Business cards, brochures or information pertaining to other businesses or services are NOT permitted on your table. Do I need to submit a door prize or provide business brochures/cards/samples for the gift bags? Of course not. But it’s a great way to advertise! Can I mail you my door prize or business brochures/cards/samples for the gift bags? Of course. Please contact me for the mailing address. What is the size of the booth area? Your display is limited to your “table top area”. Is the parking free? Where should I park and unload? Parking is FREE!! Please parking around the side of the hotel. You can unload and access the convention centre through the glass doors. After unloading please park your vehicle in the furthest parking spots to allow families access to the closer parking spots. I’m hoping to be an exhibitor for your next event. How do I get booth information/pricing and what is required from me to register? Are the tables for future events first come first served or are they offered to previous exhibitors? Tables are offered to previous exhibitors. They have approximately 2 weeks to decide if they wish to rebook. After that time an announcement will be sent out to all businesses that are registered on CalgaryMomsTradeFair.com. Tables are booked first come, first served (meaning booked and paid in full). Please register to receive show updates. Is there an exhibitor waiting list I can have my business name and information added to? No sorry. Please see information above. Register to receive show updates (click here). How do you accept payment for the exhibitor tables and sponsorships? We accept payment through PayPal. (Visa, Mastercard, American Express) or Online bank to bank transfer. We no longer accept checks via snail mail. I was an exhibitor at your trade show. Do you send out receipts after the show is over? Receipts can be sent out via email upon request. The use of your paper registration form and PayPal receipt as proof of payment should suffice. Do you have a banner or button that I can put on my website to help promote my business at the trade fair? Yes! Please contact us for images. 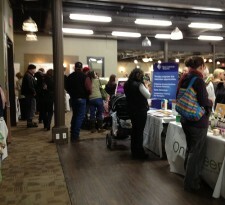 How often do you hold the Calgary Moms Trade Fair? In 2013 we are holding an event in March & October.